Ohio State Mansfield student Mark Matthews plugged in his USB drive to the instructor’s console and his group launched into a presentation for the Professional Writing class. Two 80-inch and two 60-inch flat screen monitors, as well as two projectors beamed onto motorized, semi-transparent screens at the back of the room, offered a 360 degree view of their presentation. “The room is perfect for learning because no matter where you sit, you can see and hear the instructor and see the material on the screen without having to move around,” said Diane Hixson, a student in the class. 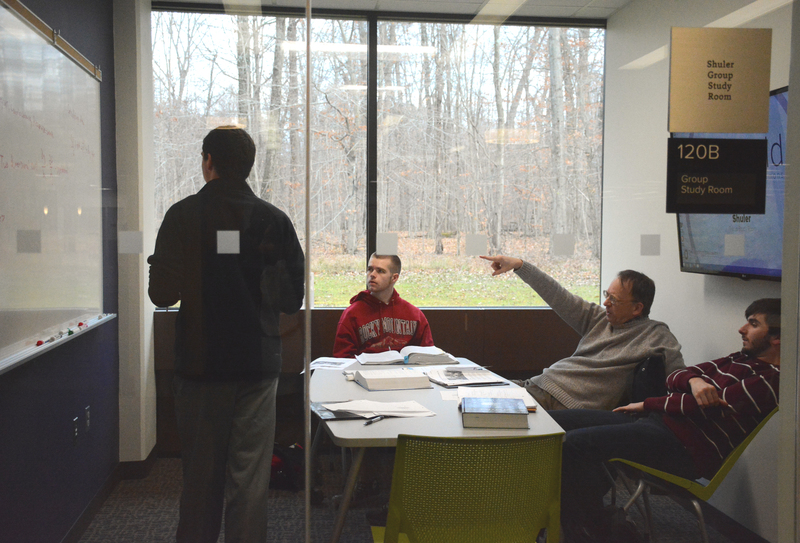 The class is just one of many using learning-centered technology in the Richland County Foundation Learning Collaborative classroom located in the Bromfield Library and Information Commons. As a resuslt of a recent $3 million dollar renovation, the BLIC is now a place not only for research, but a space to hang out with friends, attend class, or conduct a study session in one of six touch-screen equipped study rooms that can be booked in two-hour blocks. Faculty also are able to use a high-tech Richland Bank Faculty Media Center in the BLIC that allows them to record lectures and video for online courses and to supplement classwork. The studio includes a soundproof video and audio recording space with a green screen and professional lighting. Posted by Christina Drain at 8:03pm March 5, 2015 Posted in Academics. Bookmark the permalink.